The Odora Trio was formed in 2016 at the Royal Academy of Music. 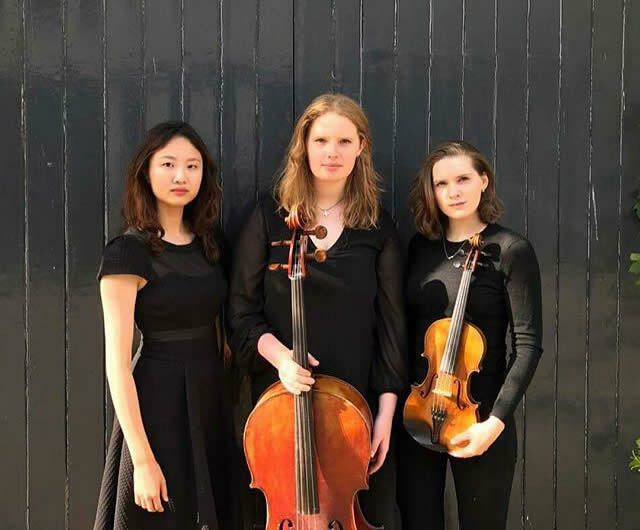 In May 2017 the trio were prize winners at the Isaacs and Pirani piano competition at the Royal Academy with their performance of Tchaikovsky’s Piano Trio in A minor. Since then, the trio has been under the guidance of eminent professors such as Andrew West, Richard Lester, William Fong, Gaby Lester Adrian Brendel, Melissa Phelps, Jo Cole and members of the Doric Quartet. The trio has performed widely throughout London and the UK including recitals at the Royal Academy of Music, The Korean Cultural Centre, Southwark Cathedral, Southwell Minster, St Brides Fleet Street, The London Charterhouse, St Peter’s Church, Eaton Square, Wrexham County and in Herefordshire performing for Concerts for Craswall, a music society set on bringing classical music to rural areas. They were selected to take part in the Piano Festival at the Royal Academy of Music where they were mentored by renowned cellist Adrian Brendel. They also attended the Wye Valley Chamber Music Summer Residency in 2018. Southwell Minster’s popular lunchtime concerts take place at 12.15pm on many Fridays, with performers coming from around the country to perform a wide variety of instrumental and vocal music in the spectacular setting of the Cathedral Nave. Home-made sandwiches (£2) and hot and cold drinks (£1) are available before the concert in the south transept from our friendly team of volunteers. Admission is free and the concerts last approximately 45 minutes. There is a retiring collection towards the cost of the concert series. Pick up a free programme upon your arrival. To be kept up-to-date with all future Lunchtime at the Cathedral concerts, please sign up to our mailing list by emailing Amy Bromilow at events@southwellminster.org.uk. For more information about specific events in the series, contact Erik Sharman at litmus@southwellminster.org.uk or 01636 817280. View more Lunchtime at the Cathedral events.